Northlight Seasonal Feeding Grapevine Reindeer Lighted Christmas Yard Art Decoration with Clear Lights, 29'' by Northlight Seasonal at Two Clock. MPN: 31601721. Hurry! Limited time offer. Offer valid only while supplies last. 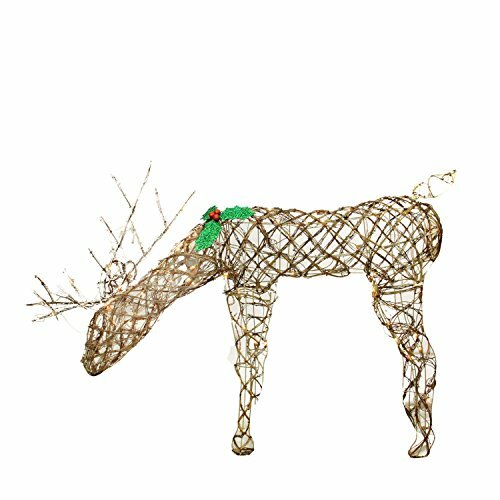 This grapevine reindeer is in the Christmas spirit wearing bright holly berries. . Product Features:. Pre-lit with 100 clear lights. Bulb size: mini. Set of 2 LED Lighted Rattan Snowy Deer Christmas Yard Art Decorations 24"-44.5"